The study dealt with the following topics: (aesthetic drawing on the rocks in contemporary Iraqi art), and it contains four chapters: The first chapter is separated by the methodological framework of the research representative: the problem of research, which can be summarized: What is aesthetic drawing on the rocks? 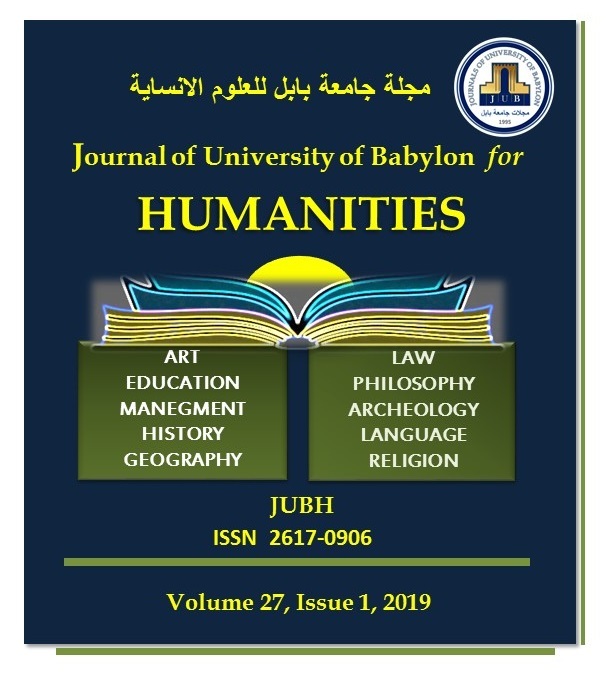 The research limits were limited to the study of drawing on rocks and the analysis of models of contemporary Iraqi painting, by adopting the descriptive method in the method of analysis in the theoretical and cognitive thesis in the analysis of the research samples. The second chapter deals with the aesthetic of the environment and its effect on the artist. The third chapter included the procedures related to the research society and the sample and methodology of the research, and then the analysis of the sample which reached (four) models. Research and conclusions preferred The most important findings of the two researchers: -1. Inspire artists from the nature of rocks and touch stones, which work on the effects inspired by the inherent relationship between man and stones and the world of dark caves and their terrain to create images and images that transmit the recipient to the original relationships and primitive atmosphere and pervasive foot As in all models. E. Marouf and Z. Al Obeidi, “The Aesthetic Concepts of Drawing on Rocks in Contemporary Iraqi Art”, JUBH, vol. 27, no. 1, pp. 249 - 268, Apr. 2019.